The Specialty Coffee Shops located throughout San Diego have a gift option that would make even Dad smile ear to ear with joy. A little over a century ago, the traditional holiday that Americans have grown to know and love, Father’s Day, began. It all started when a girl named Sonora Dodd believed that if there was a day to celebrate Mothers, then Fathers definitely deserved a day of national recognition. Although times have changed since Sonora’s day, her inquisitive and noteworthy idea to have a Father’s Day has remained unchanged. American offspring and hallmark holiday participants set aside the third Sunday of every June to take a part in Dad’s plans, whether that consists of going for a bike ride, heading to the beach, or sitting on the couch watching baseball. The only concerns that do arise, usually mid June, is what to get Dad for his Father’s Day gift. It seems like year after year people tend to give him a boring tie or a new pair of work boots. Although Dad may seem to not mind whatever it is given to him, Better Buzz Coffee wants to give their customers the option to give their Dad something less obvious, typically, and plain ordinary. 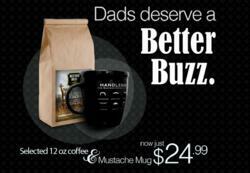 That is why Better Buzz is now offering the Father’s Day Gift Package. Better Buzz Coffee knows that every Father prefers different types of roasts so they have the option to choose from a single origin, unique blend, or espresso bagged at 12oz with our one of a kind Mustache Mug. This inclusive gift will show Dad extreme appreciation for everything he does! The exclusive gift package is $24.99 and can be found and any Better Buzz Coffee location right now.